For sale is my Beretta 686 Silver Pigeon Sporting. It's a 2006 model, and I have owned for nearly 10 years. Super gun, and would continue to do someone for many years to come. Comes with all chokes present and original documentation. 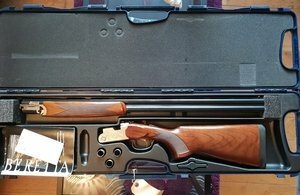 Selling as I would like a lighter Beretta O/U for field use as this is over 8lbs being a sporter. Any questions contact Jamie on 07829169514. Based near Dover in Kent. Collection only unless buying pays for RFD transfer.